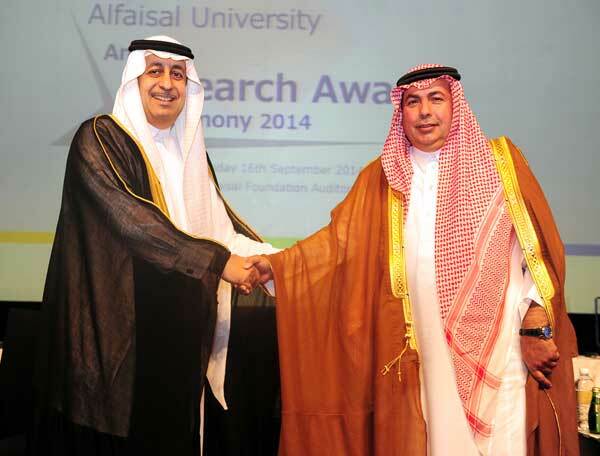 Annual Research Awards Ceremony 2014 held by Alfaisal University to honour students, faculty and Alfaisal partners. More than 60 students, in the presence of their parents, faculty and Alfaisal University partners & friends were honoured on 16 September 2014 at the King Faisal Foundation Auditorium in recognition of their research contribution to the University. Winners in the 5th Annual Research Day Student Poster Competition received trophies from the Honorary Guest Speaker HH Prince Turki Al Saud a Board of Trustees Member and VP for Research Institutes at KACST, HH Prince Bandar Al Saud, the Chairman of the Alfaisal University Executive Committee, Dr Faisal Al Mubarak, Alfaisal Provost, HH Dr Maha Al Saud, Executive Director for External Affairs and the respective College Deans; Dr Khaled Al Kattan from Medicine, Dr Nouredine Zettili from Science & General Studies, Dr Nidal Nasser from Engineering and Dr Bajis Dodin from Business. 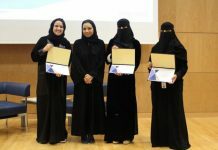 Students who received Boeing Student Research Awards and those taking part in the Shell Eco-Marathon Challenge to build more fuel efficient cars were also recognized. Faculty Awards for Research Excellence were handed to Dr Paul Ganguly from the College of Medicine, Dr Edreese Alsharaeh from the College of Science & General Studies and Dr Nidal Nasser from the College of Engineering. Patent Awards were handed out to Dr Edreese Alsharaeh and Mr Ali Othman from the College of Science & General Studies and Dr Mohammad AlDosari from KACST. 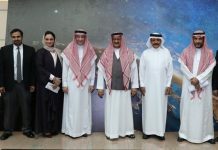 Furthermore, an agreement was signed between the Joint Centres of Excellence Program (JCEP) at King Abdulaziz City for Science and Technology (KACST) and Alfaisal University. The evening ended with special acknowledgment and thanks to the following Alfaisal partners & friends for their tremendous support in building a research infrastructure and for their unceasing support in the development of students and faculty members; HH Prince Khalid Al Saud, Board of Trustees Member; HH Prince Turki Al-Saud, Board of Trustees Member and VP for Research Institutes at KACST; Dr Sultan Al Sedairy, Executive Director of the Research Centre at KFSHRC; Eng Ahmed Jazzar, Board of Trustees Member and President of Boeing Saudi Arabia; Mr Patrick Van Daele, Country Chairman of Shell Saudi Arabia & Bahrain; and Dr Maher Alodan Director of Research, Development and Innovation at K.A.CARE.